Gerald’s popular exhibition currently running at the House of Illustration in London has now been extended until 10th February. Gerald has also contributed an exciting lot to the upcoming sale at Sotheby’s to benefit the House of Illustration – the world’s only public gallery solely dedicated to illustration and graphic arts, and a registered charity, with no public funding, relying on fundraising to raise over 40% of its income each year. 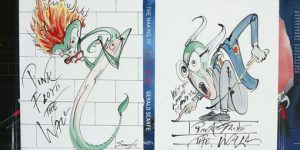 One of the auction lots is a special re-covered copy of The Making of Pink Floyd The Wall, WITH TWO ORIGINAL ILLUSTRATIONS ADDED TO DUST-JACKET BY GERALD SCARFE, each 280 by 230mm. comprising ‘The Teacher’ and ‘The Wife’, ink and watercolour, signed and dated by the artist (“Gerald Scarfe 7 Oct 2014”) on front free endpaper.